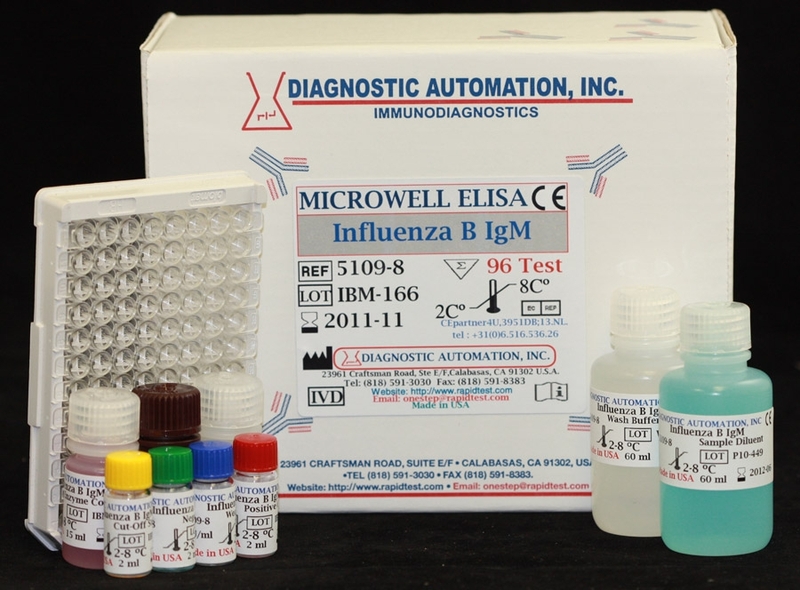 Influenza B IgM ELISA kit-Influenza ELISA Assay |CE-GMP| 818-5913030-USA. 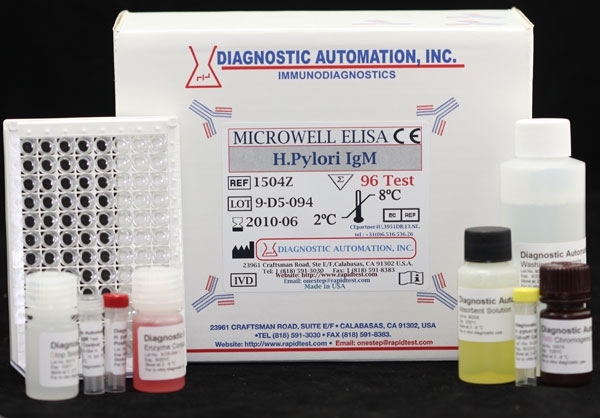 The Diagnostic Automation Influenza B IgM Antibody ELISA Test Kit has been designed for the detection and quantitative determination of specific IgM antibodies against Influenza B in human serum and plasma. Further applications in other body fluids are possible and can be requested from the Technical Service of Diagnostic Automation Inc. The influenza infection is an acute feverish virus infection, which principally leads to an illness of the respiratory tract and appears as an epidemic or pandemic. The infection mostly results from a droplet infection. The virus spreads from the mucous membrane of the upper respiratory to the whole bronchial tract. There the virus and its toxin can lead to a serious inflammation of the bronchial mucosa and a damage of the vessels. After an incubation time of 1 to 3 days the symptoms appear suddenly: Followed by a fast increase of temperature, often accompanied by shivering, the catarrhal leading symptom appears, which contribute to the clinical course beside painful dry cough, tracheitis, laryngitis and frequently a rhinitis and conjunctivitis. The Influenza viruses form a virus group with principally similar morphological, chemical and biological features. The determination of the Influenza type (A, B, and C) gives both the clinician and epidemiologist important indications for further actions. Thus Influenza B often leads to a serious clinical course and an epidemic spread of the virus. Similarly, during an Influenza A epidemic, the epidemiological importance and derived measures for the protection of the individual and population primarily stand in the foreground together with the severity of the clinical symptoms. The Diagnostic Automation Inc. 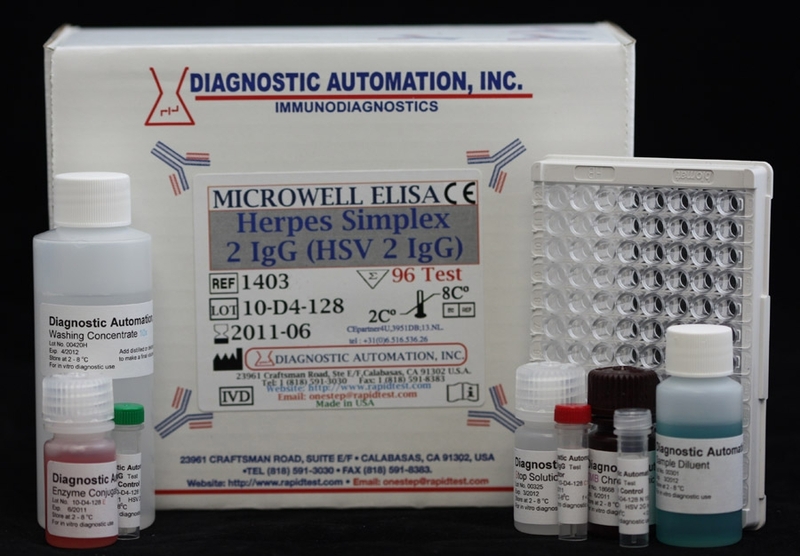 Influenza B IgM antibody test kit is based on the principle of the enzyme immunoassay (EIA). Influenza B antigen is bound on the surface of the microtiter strips. Diluted patient serum or ready-to-use standards are pipetted into the wells of the microtiter plate. A binding between the IgM antibodies of the serum and the immobilized Influenza B antigen takes place. After one hour incubation at room temperature, the plate is rinsed with diluted wash solution, in order to remove unbound material. Then ready-to-use anti-human-IgA peroxidase conjugate is added and incubated for 30 minutes. After a further washing step, the substrate (TMB) solution is pipetted and incubated for 20 minutes, inducing the development of a blue dye in the wells. The color development is terminated by the addition of a stop solution, which changes the color from blue to yellow. The resulting dye is measured spectrophotometrically at the wavelength of 450 nm. The concentration of the IgM antibodies is directly proportional to the intensity of the color. The calculated absorptions for the patient sera are compared with the value for the cutoff standard. If the value of the sample is higher, there is a positive result. For a value below the cut-off standard, there is a negative result. It is recommended to define a range of +/- 20 % around the value of the cut-off as a grey zone. In such a case the repetition of the test with the same serum or with a new sample of the same patient, taken after 2-4 weeks, is recommended. Both samples should be measured in parallel in the same run.The positive control must show at least the double absorption compared with the cut-off standard. 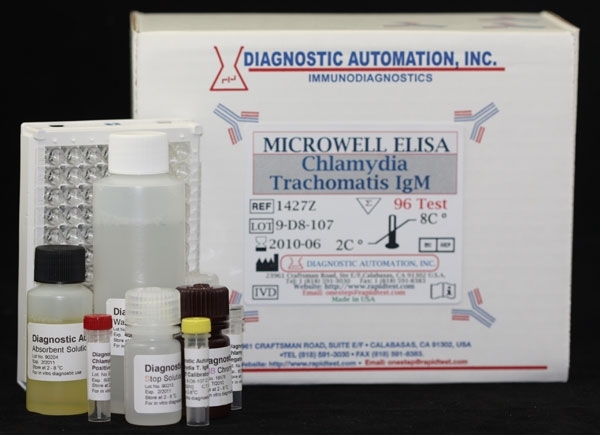 For more information about these Kits or Rapid Tests, IFA Kits, CLIA Test Kits, or Serology tests, please see our website home page, or contact our Customer Service Representative at 818-591-3030. Our Influenza B IgM have high sensitivity and specificity.